In our home we enjoy diverse cultural roots and celebrate many holidays. Hey were just party people. 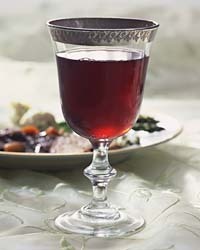 Passover is a favorite festival with its rich traditions and great feasting pleasures. Wine is always a happy component and I look to bring some good ones to the table each year. Here are some that I am looking at for 2008. Have you tried Verona Farmer's Market? It is a great Asian market with a wonderful selection of fresh fruits, vegetables and more. The prices on their produce are often half of what you might pay elsewhere. Verona Farmer's Market is now a part of our regular shopping circuit along with Trader Joe's, Kings and Whole Foods. 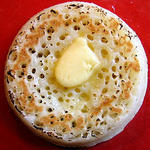 Everyone has heard the phrase "Share Tea and Crumpets." It is a British ritual in fact dictionary.com lists it as synonymous with "A Serving of Tea." But have you ever tasted a crumpet? I had not until I was offered one in Australia. They are delicious slathered with butter and honey or jam. 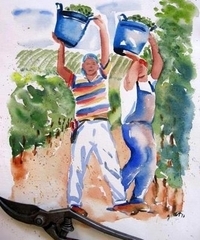 Here is installment three of my humble quest to find 6 or 7 very good inexpensive wines for the Summer of 2008 season. Today we go to Sicily to revisit a fine red, Colosi Rosso. This wine is consistently excellent, made of 100% Nero D' Avola, a grape also known as Calabrese, a very promient red grape in Sicily. Since this grape is vinified into dark, thick, flavorful reds that remind me of Australian Shiraz I thought it was an appropriate wine to include in this tasting group. Montclair's own Michael Trullinger has an enviable job: he's a cheesemonger, a professional eater of cheese. He's spent his career nibbling on cheddars, chevres and bleus. Read this great article in the Star Ledger Cheese Pro's Tips on Choosing Cheese.